The global market for quantum dots is highly competitive in nature with a large number of players operating in it across the globe, states a new market intelligence report by Transparency Market Research. The key players operating in the market, namely Quantum Material Corporation (U.S.), QD Laser, Inc. (Japan), Ocean NanoTech LLC (U.S), Nanoco Technologies Ltd (U.K.), QD Vision, Inc. (U.S.), Life Technologies Corporation (U.S.), and Nanosys, Inc. (U.S.), are focusing on research and development activities to enhance the competitive environment of the market in the next few years. In addition to this, the rising number of mergers and acquisitions and strategic collaborations are further estimated to enhance the competitive environment of the overall market throughout the forecast period. According to the market intelligence study by Transparency Market Research, in 2011, the global market for quantum dots was worth US$88.5 mn. The market is likely to reach a value of US$8,246.8 mn by the end of 2023 and further register a whopping 53.80% CAGR between 2013 and 2023. Among the key regional segments, North America is anticipated to witness a healthy growth rate throughout the forecast period. As per the report, this region is likely to remain in the leading position in the coming few years. The high growth of this region can be attributed to the rising investments and the rising research and development activities in the field of quantum dots. In addition to this, the rising demand from the optoelectronics segment and the rising demand from the healthcare sector are some of the other factors, which are likely to accelerate the growth of the North America in the next few years. Furthermore, Asia Pacific is anticipated to witness a strong growth throughout the forecast period. The global market for quantum dots has been categorized on the basis of application, among which the healthcare segment is estimated to witness a strong growth in the next few years. On the other hand, the optoelectronics segment is projected to register a fast growth throughout the forecast period. The high growth of this segment can be attributed to the unique optical properties, including emission tenability, high quantum yield, narrow emission band, and optical stability, which are expected to make quantum dots the most preferred materials for lighting and display solutions. In addition to this, the rising awareness among consumers regarding the benefits of quantum dots is likely to encourage the growth of the market and expand the number of applications in the next few years. The rising demand for quantum dots in the high-quality display devices and the growing adoption of energy-efficient or less non-toxic quantum dots in photovoltics and solar cells are some of the major factors that are projected to accelerate the growth of the global quantum dots market in the next few years. In addition to this, the rising implementation of quantum dots in several applications due to their miniature property is another key factor likely to encourage the growth of the market in the coming years. On the flip side, the increasing demand for the limited availability of the rare earth materials and the rising concerns regarding the use of heavy and toxic metals in the manufacturing of quantum dots are expected to restrict the growth of the overall market in the next few years. Nevertheless, the rising new application areas of quantum dots and the rising penetration of quantum dots in the LED general lighting are estimated to offer promising growth opportunities for the market players in the coming few years. Increasing number of applications in diverse industries to encourage the growth of the global quantum dots market in the next few years. 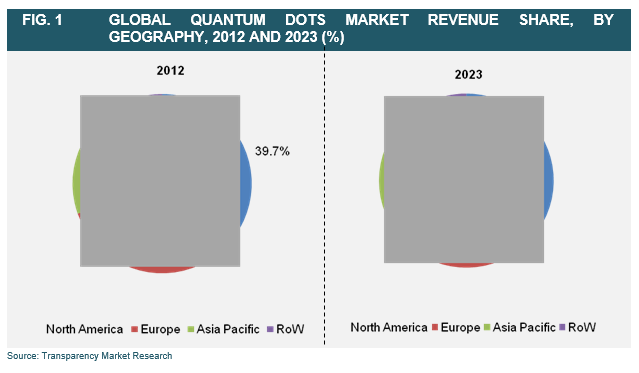 North America market for quantum dots to witness high growth throughout the forecast period.